When you are asked to talk about your favorite something, what is the first thing your brain does? If it is anything like mine, it fills up with images and stories – like pouring a bunch of bright beautiful marbles in a jar and then trying to figure out how to sort them and choose. This is what happened when I was asked to share my favorite exercises. I believe in, and love so many exercises but I have managed to narrow it down to three. And each exercise has a story behind my choice. This exercise is a true Pilates favorite. A while back, I had been experiencing some major back pain in my thoracic area around T4 to T6, and I was doing some exercise demos at a Total Gym training course. Being the person that I am, I really didn’t let on to how much pain I was in, and being a Pilates instructor, I thought that maybe some of these exercises would work it out for me. Bare in mind, I knew it wasn’t an injury; it just felt stuck … like it needed a little adjustment … so on I went with the demos. When it came time to do the Semi-Circle, I thought, Yes, this would be the one. I got myself into position with the glideboard resting right above the area of discomfort. Every time I rolled my spine up into the air and down into the floor, I reached my arms above my head while pressing my feet into the Toe Bar, taking long and controlled breaths. And on the third roll I felt a POP and the adjustment was successful! 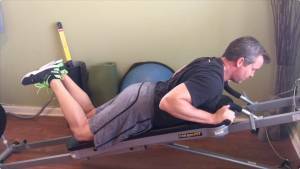 I perform this exercise often now to keep my spine in tiptop condition! This exercise is a true Pilates favorite and when I tell you the story that goes with it, you will understand. The Semi-Circle shines in a way that literally uses every part of your body, from your fingertips to your toe tips, stretching and rolling you out as if you were a piece of dough. The premise of the exercise is to position yourself between the Toe Bar/Standing Platform and the glide board. As you move the board in and out you are sequentially rolling your body (spine) in a snake like pattern, with your arms reaching above your head. To perform the exercise, you will need a Toe Bar. If you don’t have one, a Squat Stand will do. Tips: remember you are trying to stretch your spine, so reach your arms and feet away from each other. Always make sure to have a long neck and soft chest. The story behind this exercise is: I was at a rehab conference for Total Gym. Most of the people we were talking with were either Physical Therapists or people who had been or were still injured. As I was standing there with another trainer talking, a paralyzed lady in a wheel chair drew near and expressed that she wasn’t really able to feel her lower abdominals. So we helped her onto the Total Gym and put her in the seated surfer position. 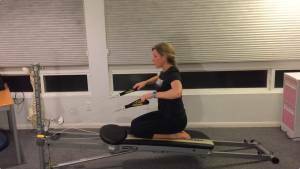 And here is when the magic happened – as she started to do the movement and the glideboard began to become unstable, she in turn reacted as to not fall back by stabilizing with her upper body. Being in a wheelchair for such long periods of time meant her upper body was always supported and suddenly she was using the back extensor muscles, and all her abdominals particularly the rectus abdominis. She said, “Wow, I have never felt this before!” This exercise is good for everyone, especially those with tight hamstrings and gluts and for those with poor posture. Even if you are trying to maintain your level of fitness it’s a great exercise because it is so much about stabilization, spinal extension and abdominal engagement. I chose this exercise for its sheer simplicity. It’s so basic but almost every muscle in the upper body is forced to activate while you move your arms. You are just in a seated position with your legs extended in front of you towards the tower. Your hands are holding on to the pulley cables and your arms are making a surfing motion. 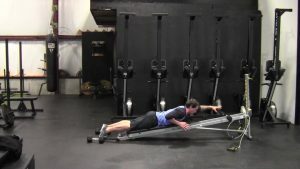 To perform the exercise, adjust the incline level to around 3 or 4. Tips: Try pressing your legs down into the board while extended. Also force yourself to have the best posture possible. You can also add a forward bend in between each rep.
After having my daughter I found myself in a very fragile state with my body. As you know when the body goes through a pregnancy, bones shift, ligaments stretch and muscles pull. Because of this it exposed all my old injuries. Basically my right side was not working as it should, but I was forced to use it in my daily activities: to get in and out of bed and up off the floor, all while holding my daughter. By the time it got better my left side was taxed. Every time I walked and went to put weight on my right leg my left leg would drag behind. This is when I turned to my old friend, the Leg Pull Accessory. I took my time starting with small circles and slowly got bigger. It took about full year to completely heal and regain total strength in both sides and it wasn’t easy but I’m a believer in the process and knew I would get there eventually. There will never be a time in my life when leg circles in the leg pulley are not essential. They allow you to work your hips and legs in a full range of motion. For me, they brought strength and stabilization back to my hip socket while gently stretching my inner thighs. To perform the exercise, you will need the Leg Pull Accessory. Tips: Make sure you try to maintain a neutral spine. Keep your right hip stacked on top of your left hip. The goal is to have optimal range of motion in the hip socket. So in a nutshell those are my three favorite exercises with three heartfelt stories. I love to mix Pilates and Yoga with strength training and the Total Gym allows me to do that. I love how I can actually be in a yoga pose while doing bicep curls at the same time! Melissa L. Muniz is a certified Pilates Instructor, Dance teacher, Choreographer, Actor, Model and full time Mom! She has spent over a decade traveling the world studying traditional dance such as Flamenco in Spain and cultural dance in Indonesia to name but a few. She has toured with Nickelodeon as a dance performer and actor and starred in several music videos and movies.Melissa had the opportunity to train teachers for the opening of the first Pilates Studio in Kuala Lumpur, Malaysia and has been working with Total Gym as a Gravity Master Trainer since 2002. She has loved the inspiration and support that Total Gym gives and lives by. Melissa now resides with her family in Atlanta GA, teaching at a Wellness Center where she infuses life, happiness and understanding of the body, to those with an open heart and mind.